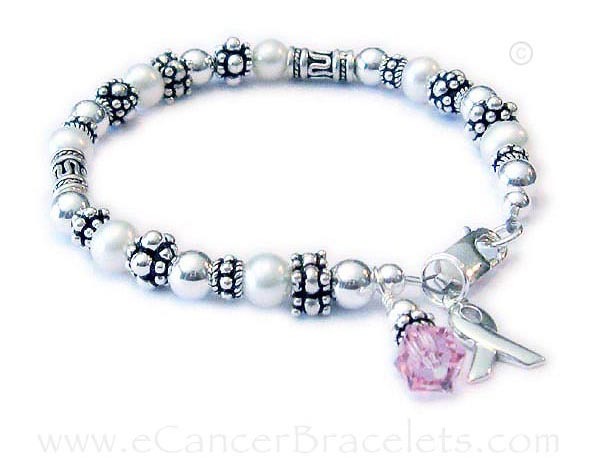 This beautiful Pearl, Bali & sterling Survivor or In Memory bracelet is made with Swarovski pearls (pink for breast cancer is shown), LOTS and LOTS of sterling silver Bali style beads, alternating with different sterling Bali beads. 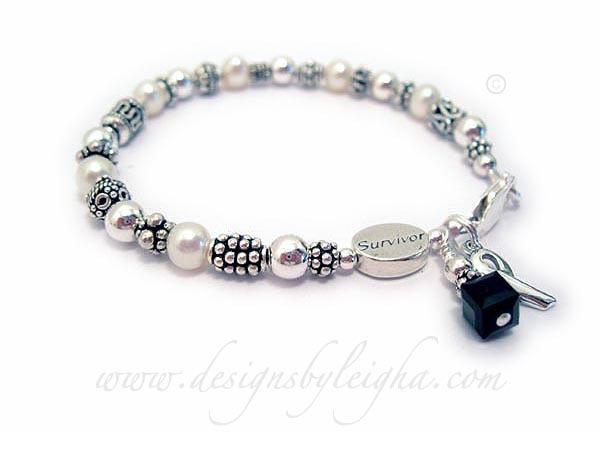 This Survivor Bracelet includes one Swarovski crystal dangle and a ribbon charm. You choose the type of clasp during the ordering process and you may also add additional beads or charms. Scroll down for larger pictures and more information about each design. 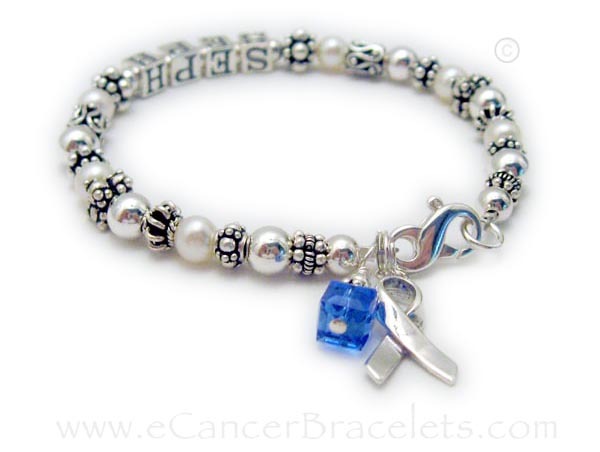 Survivor Bracelet with Cancer Crystal Dangle and PLAIN Ribbon Charm (included in price). Shown with the simple silver lobster claw clasp. Gold Beads, Clasp and Ribbon charm were added to this design. 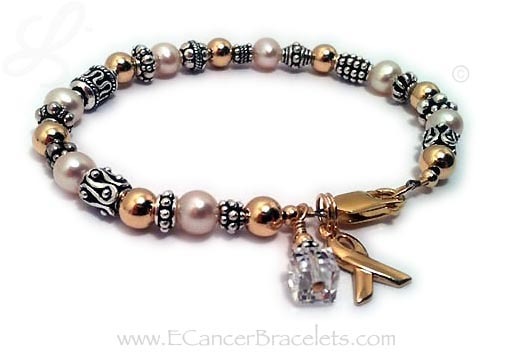 This bracelet comes with the Crystal Dangle and Gold Ribbon Charm. This bracelet is shown with the upgraded Gold Lobster Claw clasp. 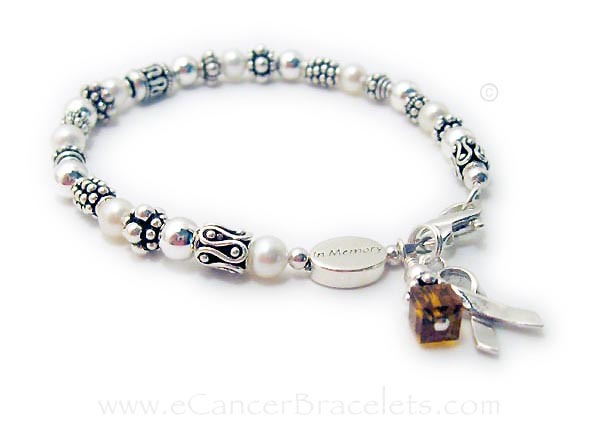 Shown with November/Golden Topaz/Golden Crystal (leukemia awareness) and ribbon charm. The IN MEMORY bead is an add-on. Shown with the simple sterling silver lobster claw clasp. Shown with a black Swarovski crystal & Ribbon Charm & lobster claw clasp. They also upgraded and added a SURVIVOR bead. 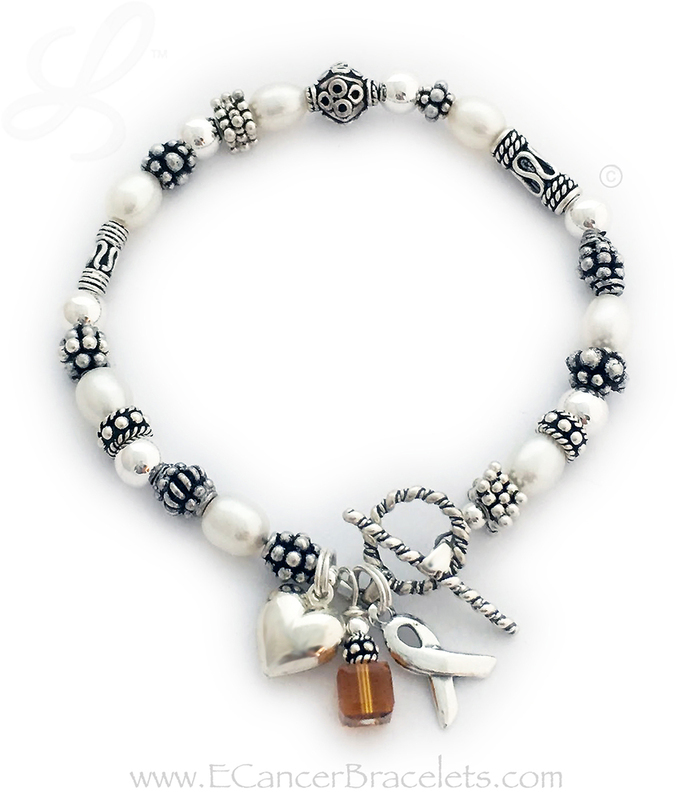 Shown with an Orange Swarovski crystal & Ribbon Charm & twisted toggle clasp. They also added a Puffed Heart Charm.